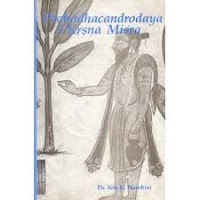 We earlier posted certain sections of Krsna Misra’s 11th century allegorical drama, Prabodhacandrodya, in which the character Cārvāka makes an appearance. Though Prabodhacandrodaya does caricature Carvaka/Lokayta philosophy, the play is an important source of our present day knowledge about materialist philosophy in ancient India. We now reproduce parts of the critical introduction written by Dr Sita K Nambiar for her translation. In the 19th century Kṛṣnamiṡra’s Prabodhacandodaya was widely read by European Indologists and as a result the worked was translated into several European languages1. At least one scholar2 to my knowledge has written a study on it, investigating it as a drama. But the philosophical contents of this play have not yet been specially treated. I am undertaking this work with the hope that it may contribute to tracing the history of the development of Indian philosophy. This play can be dated with some precision from the author’s references in the Prologue. It was produced at the instruction of one Gopala in the presence of his friend Kirtivarnman, whom Gopala had restored to his kingdom after defeating the Cedi king Karna3. Now the Deogarh inscription of the same Kirtivarman of Jejakbhukti is dated 1098 AD. According to the Mahoba inscription Kirtivarman defeated Laksmikarna, i.e, the Cedi king Karna of Tripuri, who is mentined in an inscription, dated 10452 AD. In the Vikramankadevacarita 1819 Karna is called Kalah Katanjaragiripateh, “The Death of the (Candella) king of Kalanjara”, which corresponds to Kṛṣnamiṡra’s statement4. Gopala might have been an ally through whose valour Kirtivarman defeated Karna, but the commentator Mahesvara says that he was the Commander-in-Chief (senapati) of Kiritvarman and was a Brahmana. Most probably the play was written between 1042 and 10985, and it can be concluded that the author belonged to the second half of the 11th century, perhaps even the beginning of the 12th century. According to a tradition6, Kṛṣnamiṡra was an ascetic belonging to the Hamsa order of the Advaita School and had many disciples. One of them was interested in kavya but not in philosophy. Kṛṣnamiṡra is said to have written his dram in order to teach him the Advaita doctrine. Prabodhacandrodaya is an allegorical drama. Kṛṣnamiṡra was not the first Indian poet to write an allegorical play, though not much is known about the earlier literature of this class. There are the fragments of a Buddhist allegory with Kirti (Fame), Dhrti (Firmness) and Buddhi (Wisdom) as characters, which was perhaps written by Asvaghosa7. Then, there is an allegorical play called Agamadambara, still in manuscript, written by Jayanta, the author of the Nyayamanjari, who lived in the 9th century AD. After Kṛṣnamiṡra, however, quite a number of allegorical plays were composed8. The name Prabodhacandrodaya has been translated variously by various scholars. J. Taylor translated it as “Rise of the Moon of Intellect”, Winternitz as “Erkenntnismondaufgang9”, Macdonell as “Rise of the Moon of Knowledge10”, SK De as “The Moonrise of True Knowledge11”, and Dr. Boissevain as “Maaansopgang der Ontwaking12”. The word prabodha requires some discussion. Taylor’s translation of it as intellect is not satisfactory. Winternitz’ and Macdonell’s translation as Erkenntnis and knowledge is certainly nearer to the correct mening. However, if we accept it, we have to render vidya by some other term, but vidya is properly knowledge. Boissevain’s translation as “Ontwaking”, ie Awakening, which is literal, seems to be the best rendering of the Saskrit word. The awakening treated in the play is a sort of spiritual realization. Pursusa (Man), who had forgotten his identity with the Supreme Being, Paramesvara, and had fallen as it were, into a deep slumber, is awakened by Vidya or Knowledge to realize his identity. 2. Candrasya udayah candrodayah, prabodha eva candrodayah, prabodhacandrodayah. In the first case, awakening is identified with the moon and in the second case with the moon-rise. Taylor and Macdonell follow the first, while De and Boissevain follow the second. Winternitz’ translation is quite as ambiguous as the original. It can mean either Erkenntnismond-Aufgang or Erkenntnis-Mondaufgang. What Kṛṣnamiṡra means, however, is clearly prabodhacandasya udayah, “the rise of the moon which is awakening”. This can be proved by a passage of the play itself. In the first act13 the compound prabodhacandra is used by Kama: Prabodhacandrena bhratra … Therefore, I would translate Prabodhacandrodaya as “The Rise of the Moon of (spiritual) Awakening”. There are several edition of the play, which I have listed in the Bibliography. Though the text of the Nirnayasagar edition is not always the best, I have used this edition throughout and given references according to it. Where its readings seemed unacceptable, I have in a few places preferred those of the Trivandrum edition. The commentaries which accompany the text in the Nirnayasagar edition, Candrika and Prakasa, I founduselful in several places. The commentary of the Trivandrum edition, Natakabharana, has also ben consulted. See Winternitz, Geschichte, Vol. III, p. 181 f.
See Dasgupta, History of Sanskrit Literature, p. 480 ff. ; Winternitz Geschichte, Vol. III, p. 256 ff. Kṛṣnamiṡra deals with this school at great length. Lokayata is the system founded by Vacaspati, also known as Brihastpati, who handed it over to Carvaka, who in turn spread it in the world through his disciples1. The word lokayata means “what prevails among men”. The Lokayata or Carvaka system is materialistic. It is the foremost enemy of all religious and philosophical schools based on the Vedas. According to Krsnamistra, Buddhism, Jainism, and the Kapalika sect are based on the Lokayata system2. Therefore, once this system is overthrown, the schools and sects derived from it are also ruined. All the Vedic schools in the play join together to defeat the Carvaka system. As to the question whether there is a soul separate from the body, we get the answer in the following verse, put in the mouth of Delusion who is depicted in the play as the great friend of Carvaka: “(The view) that there is a soul separate from the body, which on reaching the other world enjoys rewards, is (like) the hope to get tasty fruits from the big flower of a tree in the sky3”. The opinion that after the death of the body no soul remains is expressed in the following: “The many talkative believers (astikas) who jabber in vain that the thing which does not exist, exists, condemn the truth-speaking non-believers (nastikas)4. Oh, look, has anyone in reality seen a soul separate from the body, which has formed the intelligence as transformation (of itself)5”. The materialist does not believe in the caste system (varnabheda). He does not recognize moral precepts. He teaches: “If the bodies are like in their different parts, the mouth, etc, how can there be a hierarchy of castes? We do not accept any difference between a woman or wealth belonging (to us or) to somebody else. Only those who are devoid of manliness consider whether an act should be done or no, when it entails injury, approaching women at one’s pleasure and seizing the wealth of others6”. According to the Carvaka, the only means of knowledge is perception7. The elements are earth, water, fire, and air. Wealth and pleasure8 are the sole aims of man. The elements move through original impulse. There is no other world. Emancipation is death. Knowledge consists only on statecraft. Varta or the science of agriculture and trade is included in this9. The three Vedas are incoherent talk of cheats10. If their teachings about sacrifice lead to heaven, the processes similar to sacrifices must lead to the same result: “If sacrifices obtain heaven by the destruction of the sacrificial matter through the action of the officiating (pries), then the trees burnt by the forest fire will bear ample fruit11”. The teachings of the Veda are nothing but nonsense: “If it is assumed that an animal slain (in sacrifice) goes to heaven, why does not the sacrifice forthwith immolate his own father12”? “If sraddha (offering of rice-balls to a dead person) produces gratifications to being who are dead, then oil may rear the flame of an extinguished light13”. “It is the reasoning of fools that the pleasure which arises to men from contact with sensible object is to be relinquished as accompanied by pain. What man seeking his true interest would fling away the berries of paddy, rich with the finest white grains, because they are covered with husks and dust14”? “Brhaspati says that the oblation in the fire, the three Vedas, the carrying of three sticks tied together, and smearing oneself with ashes are the means of livelihood of those who are devoid of intelligence and manliness15”. The Carvaka classifies the Vedantins along with the Buddhists: “If the Vedantas (i.e the upanisads), which accept things contradictory to what is established through the means of knowledge, sense perception, etc, are authoritative scriptures (sastra), then what wrong are the Buddhists doing16?” The Vedantin says that the world which he knows through the means of knowledge is unreal. That implies a contradiction. The Buddhist, on the other hand, says that everything has only momentary existence, which is just as contradictory to experience as the Vedantin’s view. Pra. Ca, p. 71. The word Carvaka means “sweet-tongued”. Pra. Ca. V p. 176 f.
Pra. Ca. II. 16 akasatarroh prasunam, more commonly khopuspa is an example given usually for a thing which does not and can never exist. The words astika and nastika specifically denote those who accept, and those who do not accept, the authority of the Vedas. Pra. Ca. II v.17. Cp.Madhava Sayana: Sarvadarsanasamgraha (S.D.S), Calcutta, 1908, . p.2 caitanyavisista eva atma. The reading varsmanam in the Nirnayasagar edition is a misprint for varsmano. There is a work of the materialist school called Tattvopaplavasimha, by Jayarasi Bhatta (8th century) (published in Gaekwad’s Oriental Series, 1940), which does not accept any pramana, not even pratyaksha. This shows that the Carvakas were divided among themselves, some accepting perception and some accepting no valid means of knowledge at all. Artha and kama, dhrama and moksha are dismissed. Pra. Ca. p. 71: dandanitir eva vidya. Atraiva vartantarbharvati. Cp. Kautilya, Arthasastra: anviksiki trayi carta dandanitis ceti vidyah (I. 2.1); varta dandanitis ceti barhaspatyah (I.2.4); dandanitir eva vidyety ausanasah (I.2.6); tasyam hi sarvavidyarambhah pratibaddha iti (I.2.7); krsipasupalye vanijya ca varta (I. 4.1); Brhaspatisutra 1.3: dandanitir eva vidya. It is to be noted that whereas the Brahaspati of Kautilya accepts varta and dandaniti the author of the Brhaspatisutras, who is obviously a theist, accepts only dandaniti, like the Carvaka of Krsnamistra and Kautilya’s Ausanasa. Cp. Also Frauwallner, Philosophie II p. 296: “…die enge Verbindung des Materialismus mit der politischen Theorie.” Also cp. Ruben, Maaterialismus. Cp. S.D.S. p.3: dhurtapratapas trayi. Pra. Ca II. V. 19. This verse is quoted verbatim in the Sarvamatasamgraha. Pra. Ca. II v.21 Cp. S.D.S p.6, where the second line of the verse is different. Pra. Ca. II v.26 Cp. S.D.S p.3 and Sriharsa, Naisadhiacarita 17.39. The verse also occurs in the Sarvamatasamgraha and in the Sarvasiddhantasamgraha attributed to Sankara. All these works must have quoted from a work of Brahaspati which must have been extant as late as the 12th century, in which both Sriharsa and Madhava, the author of S.D.S, lived. Pra. Ca. II v.4. This verse too is quoted in the Sarvamatasamgraha. Krsna Misra: Prabodhacandrodayam with the commentary Natakabharana, Ed. by K. Sambasiva Sastri, Trivandrum Sanskrit series LXXII, Trivandrum, 1936.